For a “quickie” project — something you’ll hide in a pumpkin or lawn ornament for Halloween night and then dismantle afterward to use in other projects — assembling the components on a breadboard will usually suffice. For breadboard use, you’ll need to solder header pins to the Audio FX board. These are included in the package. Two “tiny” breadboards side-by-side allow access to both the audio jack and USB port on the Audio FX board. Alternately, a “full-size” breadboard could be used, if sufficient space is left between components, so cables can fit in both ends. 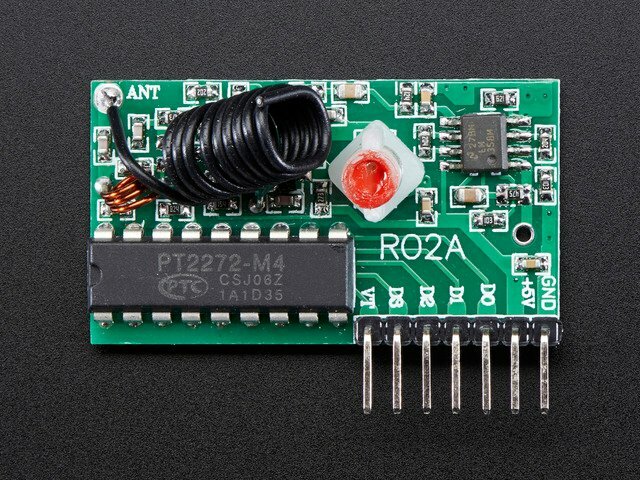 The audio board uses “active low” inputs for buttons, but the RF receiver produces “active high” outputs. That’s just one of those things…they were designed by different people at different times for different tasks. Adding a 74HC04 chip between the two “inverts” the signal, so they’re speaking on the same terms. 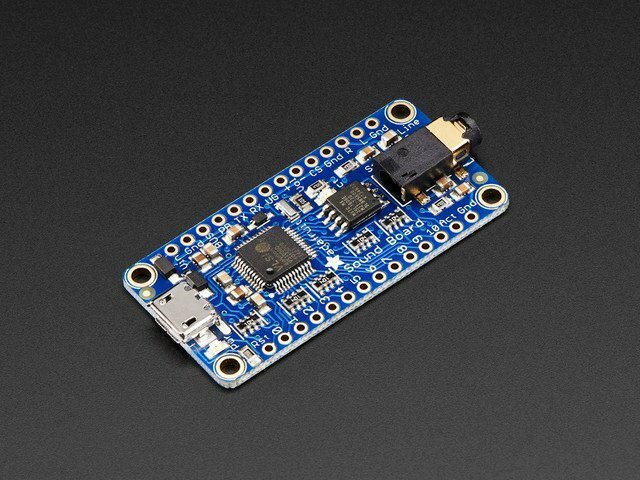 Adafruit doesn’t offer this part, but it’s one of the most common logic chips out there…if you’re blessed with a local electronic parts store, or have a circle of hobbyist friends, they might have one. 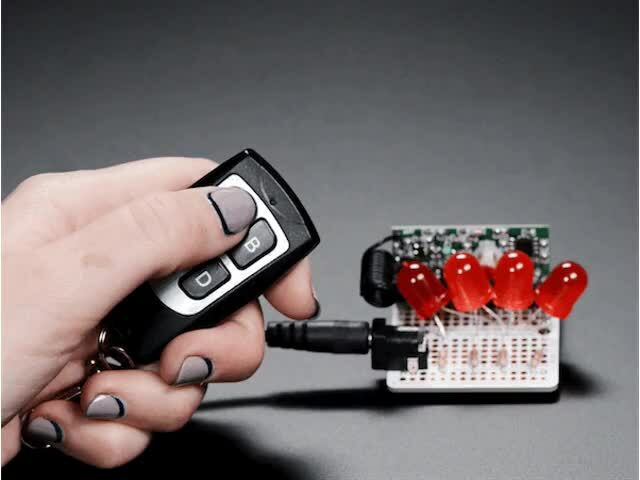 Otherwise it can be sourced online from distributors like DigiKey, Mouser or Jameco. A 74HC14 works just as well, if that’s easier to acquire. Pinout is identical. The 74HC04 has six inputs and six outputs. Face-on, with the “bite” at the top, notice that each input pin is always directly above its corresponding output pin. They’re not turned around on the other side of the chip. Also, the two sides are not aligned, due to the power pins at opposite corners. We’re only using four of the six inputs. But it’s vitally important that the unused inputs are not left “floating” (unconnected) — it’s not destructive, but can make the circuit fail to work until fixed! Notice the two short blue wires in the diagram at the top…these connect two of the “real” inputs to also go to unused input pins, so they’re not left floating. The unused outputs don’t need any connection, that’s fine. The RF receiver outputs don’t correspond to buttons in the order you’d expect. Remote button “A” goes to D3, “B” to D2, “C” to D1 and “D” to D0. We compensate for this in the wiring, reversing the order so it’s more intuitive when assigning sound filenames to button numbers. Normally we’re fans of lithium-polymer batteries for projects, but in this case it’s not a good fit. 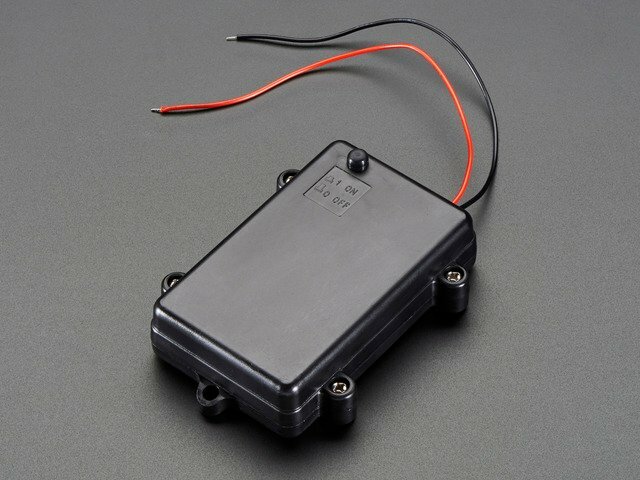 The receiver requires at least 4 Volts, a little more than LiPo batteries provide. Three alkaline cells provide 4.5 Volts total…AAA cells will keep it running for many hours, or AAs can be substituted for even longer run time. 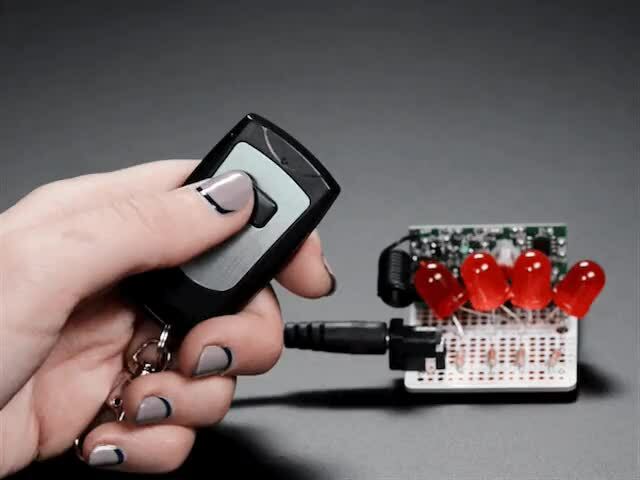 You can also power it from a USB battery pack (but not a USB cable to a computer…that makes the audio board go into “flash drive” mode). 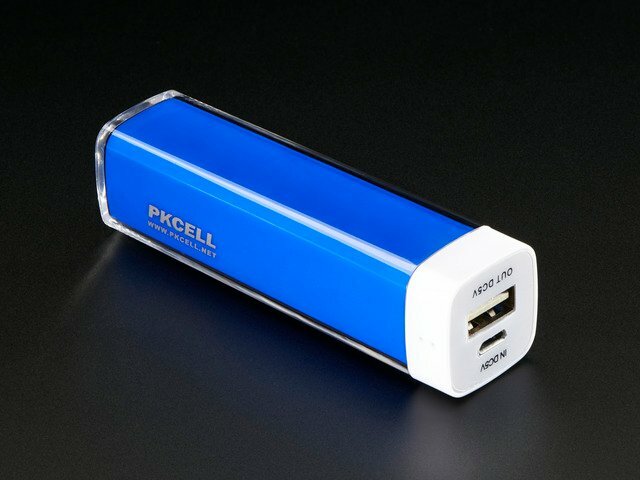 Power users who are adamant about having a rechargeable LiPo battery could use a PowerBoost 500 Basic or 500 Charger, but for the majority of users the alkaline batteries are perfect…simple, inexpensive, and the battery case even provides a power switch. I love these little “impulse buy” portable MP3 speakers you sometimes find in drugstores. Not the loudest thing, but they’ll do for many tasks. Bigger is better though…you can turn the volume down on a too-big speaker, but a too-small speaker will always be too small. Some higher-end portable speakers include a phone charging port…you can use this to power the circuit over USB, eliminating the AAA battery pack. These speakers are expensive, and you may understandably be hesitant to leave them out in a yard display! We also now have a version with an integrated 2 x 2W amplifier, so it’s easy to add your own speaker(s). If you need something super custom, perhaps for an oddly-shaped space like inside a prop or costume, we do have various audio amplifiers and speakers in the shop. These can connect directly to the R, L and Gnd pins on the audio board. Read the Audio FX Sound Board Guide for directions on loading and triggering sound files. 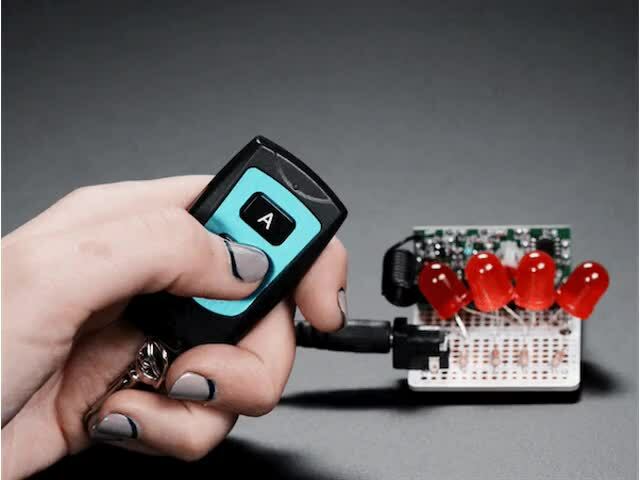 Although the Audio FX board supports up to 11 triggers, the remote control only provides four. This is not as limiting as it may seem…the guide linked above explains how to cycle through multiple files for each trigger. A green light on the Audio FX board indicates it’s receiving power. A red light means it’s currently playing a sound. A wonky connection on the breadboard. Try moving wires to other socket holes, or replacing the jumper wires. If it’s really temperamental and only works with some wiggling, you may need to solder up a more robust circuit…we get into that on the next page. Incorrect wiring on the 74HC04 chip, such as floating inputs, or inputs in the wrong order. Refer to the pinout earlier on this page. If it still refuses to work, remove the 74HC04 from the breadboard and try triggering sounds manually with a jumper wire between one of the trigger pins and GND. If that doesn’t work, it may simply be a file naming problem. Refer to the guide linked above for directions. If it seems to be a problem in the circuit, you can post on the Adafruit Forums and we’ll do our best to assist. It’s helpful if you can provide clear photos of your wiring, and describe the symptoms as thoroughly as possible. These remote devices all operate on the same frequency. If you have several, they can interfere and trigger sounds at the wrong time. On the back of the RF receiver board, and also inside the remote control fob (you'll need to pry it open and remove the batteries and circuit board), there are three rows of blank copper pads that can be bridged with solder to assign a different “address” to the remote and receiver. The exact same combination must be set on both boards. 8 pads allows for 256 different addresses…I just picked a combination at random. This is harder than it looks! Especially on the remote fob, the pads are very tiny. I’ve soldered a few things in my time, and it still took me three tries and solder wick to get it right. So you may want to avoid doing this unless you’re certain the default address is a problem and also have some patience and ninja soldering skills. This guide was first published on Oct 06, 2014. It was last updated on Oct 06, 2014. This page (Wiring) was last updated on Apr 25, 2019.